Peter’s back. So is George, Molly, the Lost Boys, and the Evil Lord Ombra. Thought he was destroyed at the conclusion of book two? I thought so too. But he regathers his strength and returns to Rundoon where the forces of darkness have come up with the most farfetched plan yet: capture Peter, use his powers to call down more starstuff, and with it destroy the universe. The stakes are high in this one. The highest imaginable. For the cosmic war between forces of light (creation) and forces of darkness (destruction) are revealed. You see, life is only an accident caused by a leaking of stardust to earth (sounds similar to the theories fed to me in school), merely allowed by the forces of light, but their attention is focused elsewhere. Peter can expect no help. Meanwhile, things aren’t going too swimmingly in Never Land. The Island has been captured by a tribe of fierce savages called the Scorpion who are working the natives and the Lost Boys to death. Peter must save them both. His outrageous methods involve a rocket, monkeys, luck, a flying camel, and a flying ship. Peter and the Secret of Rundoon includes a LOT of action and returns to the slap-stick-type violence of book one. There are some casualties, including a few people fed to the giant crock, Mr. Grin, and King Zarboff’s giant snake, and Molly is praised and rewarded by her father for disobeying him, but overall the book is kid-appropriate. There’s no profanity. It’s fast-paced and highly entertaining. Like in the first two books, we’re given more explanations for the original Peter Pan story: Peter’s family background, how Mr. Grin swallowed the ticking clock, and how the ship Jolly Roger came to fly. The series is a must-read for kids 10+. Sounds like you really have enjoyed this series. 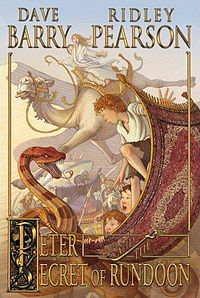 Like the idea of a different take on Peter Pan, one of my favorite fairy tales. Such a great read for middle graders. Ha, ha! Sorry, Pat. 🙂 The Giver is really unique. I think you’ll like it, too. It’s deep.